‘Exclusivity’ is the key word to describe HSV’s Z Series program. That becomes particularly evident when discussing the remarkable new 6.0 litre LS2 engine and upgraded drivetrain, virtually the whole of which is now totally exclusive to HSV. The significance of the Z Series will not go unnoticed. HSV models have always been differentiated by exclusive and premium engineering features, but the Z Series package takes the brand to a new level. The company has for some years promised and has been delivering more and more unique ‘under the skin’ technology and mechanical features. Z Series line up once again showcases the exclusive next generation position, that HSV intends to continue to dominate in the Australian and New Zealand Performance/Luxury niche market. The model signals an exciting new direction for the company, effectively delivering a killer marketing punch to any local copy efforts by so called ‘competitors’, and providing a very serious alternative to the popularity of more expensive European choices. As GM’s latest Gen IV powerplant, the 6.0 litre LS2 is a state-of-the-art V8 that draws on a long heritage of small block engine design. It builds on the high output foundations of the 5.7 litre Gen III unit with a range of design innovations and a step up in capacity to a massive 6.0 litres that has created a substantial stride forward in all round driveability and performance. The LS2 made its world debut in the all-new C6 Corvette sports car but, significantly, that beat HSV to market by mere weeks as this awesome new powerplant becomes standard for all Z Series RWD models, as well as WL Grange and GTO Coupé which are launched simultaneously. It’s important to note that the LS2 was specifically designed from the outset as a high performance engine. Its multitude of advanced features and its push rod design gives it the ideal specification package for a large capacity high output V8 engine. Compared with an overhead camshaft V8 engine of a similar capacity and configuration, the all alloy LS2 is demonstrably lighter, more compact and is more efficient to manufacture and therefore service, yet it produces an extraordinary spread of performance. What’s more, early indications are that fuel efficiency in everyday driving conditions has the potential to be just as outstanding as the performance (up to a 7% improvement is expected). And, this engine offers ‘green’ credentials by meeting the ultra-stringent Euro 3 emission standards which are not due to be introduced until 2006. Making the 6.0 litre LS2 exclusively available to HSV customers called on a massive effort from the engineering team and once again they were up to the challenge. The realities of developing the LS2 to fit HSV’s right-hand-drive range of sedan, ute, coupé and long wheel base models took a large proportion of the two year time frame dedicated to the Z Series program. 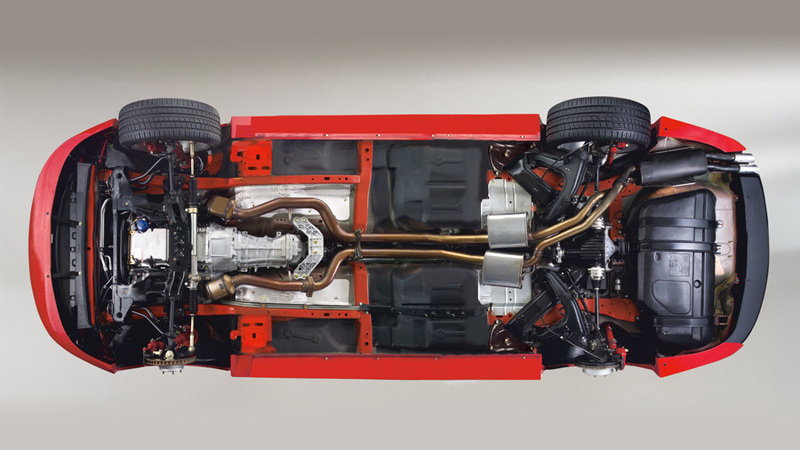 As well as significant modifications to the cooling, fuel and exhaust systems, one of the major tasks was the design and manufacture of a totally unique-to-HSV main wiring harness for each of these models. The HSV enhanced 270 kW 5.7 litre LS1 (which has been the company’s mainstay since it took over from the 5.0 litre V8 for VT Series 2 in 1999) is still the engine of choice for the latest crop of HSV AWD models. Indeed, its enduring attributes of refined torque delivery have made it particularly suitable for HSV’s all-wheel-drive models where it will continue to perform superbly. However, for HSV’s outright performance applications the LS2 is even better suited due to the next generation performance technology that has been applied during its design phase. Following is a list of the most significant upgrades that contribute to the improved performance of the new HSV Z Series. • Cylinder bore diameter is increased from 99mm to 101.6mm producing an overall displacement of 6.0 litres (5967cm³). • Compression ratio is 10.9:1. • The lightweight block is cast from 319-T5 aluminium with ‘cast in place’ iron cylinder bore liners. • As per LS1, the block is a deep skirt design, meaning that it extends below the crankshaft centreline, which contributes to greater structural rigidity and operating smoothness. • Immensely strong bottom end construction with cross bolted main caps. While some engines employ just two vertical bolts to secure the main bearing caps, LS2 (and LS1) get ultra-heavy duty by using four vertical main cap bolts supplemented by two extra horizontal cross bolts to form a massively rigid bottom end. • 4% lighter than LS1 which was already a lightweight engine. At around 180kg ready to run (without ancillaries) LS2 is considerably lighter than most V8 engines, irrespective of their design philosophy. The reduction in engine weight has also aided weight distribution and chassis balance. • Aluminium cylinder heads are derived from the design used for the previous Corvette Z06 high performance model, including raised intake ports and an unshrouded valve combustion chamber design. When combined with the new flat top pistons this produces a more efficient swirl of the air/fuel mixture, allowing a high compression ratio which boosts power and fuel economy. • Camshaft lift is increased to take advantage of the increased cylinder head flow. • Valves measure 50.8mm for the intake and 39.4mm for the exhaust and heavy duty valve springs are fitted. • More powerful Engine Control Unit. With more memory, faster processing and a new software set, the LS2 ECU has plenty of reserve capacity to oversee the functions of the Electronic Throttle Control, Traction Control and Cruise Control. It has been specifically calibrated by HSV engineers to suit local conditions and deliver serious ‘all round’ V8 performance. The result is both an improvement in smoothness and driveability as well as a reduction in vehicle emissions. In particular the Traction Control action is now so subtle that it’s difficult to determine when it’s operating. The latest generation switchable traction control is now fitted standard on all HSV RWD models including Maloo. This is a unique safety addition for any Australian V8 sports utility. • The LS2 breathes via a large bore, 90mm single blade Electronic Throttle Control intake body. Electronic, rather than mechanical, management of the throttle has produced significant gains in smoothness, responsiveness and driveability which make the Z Series models particularly easy to drive in everyday traffic conditions. • While for maximum performance premium unleaded fuel is preferred, the LS2 is suitable for use with standard unleaded fuel due to its advanced knock sensor design and HSV calibration of the Electronic Control Unit. • Large capacity fuel pump. • Advanced catalytic converters are both more efficient and less restrictive and are mounted closer to the exhaust manifold for quicker ‘light off’ and reduced cold start emissions. The exhaust note can be described as ‘aggressive’. • LS2 already meets Euro 3 emission standards which are not due to be implemented until 2006. • Unique HSV designed engine cover. In HSV form the LS2 delivers an outstanding 297kW @ 6000rpm (305kW DIN) and 530Nm @ 4400 – an increase of 12kW and 20Nm, respectively, over the LS1 engine. However, peak power and torque figures don’t tell the full story – the range of power and torque is considerably broader than LS1, making LS2’s immense performance capabilities easily accessible even from very low in its rev range. Indeed, 87% of peak torque (463Nm) is available from a low 1600rpm and the output never drops below that figure until after 6000rpm. The old adage says ‘there is no substitute for cubic inches’ and with a 6.0 litre capacity and an advanced design specification there is definitely no substitute for HSV’s LS2. The reality of having extraordinary reserves of torque available throughout the engine’s rev range is instantaneous response to throttle pressure, irrespective of whether the vehicle is starting off in first gear or cruising at highway speed in sixth gear. Significantly, it’s not just the awesome LS2 engine that’s exclusive to HSV – for Z Series virtually every drivetrain component has been upgraded and is now unique to these models. Manual transmission fans will revel in the HSV unique Tremec M12 six-speed gearbox. It is essentially the same as that fitted to the Corvette, complete with triple cone synchromesh (for a quicker, smoother and more enjoyable shift action) and lower ratios than the previous transmission. It’s accompanied by a heavy duty Corvette C6 type clutch that features higher clamping pressure to help transmit the engine’s mammoth torque load. In addition, HSV has taken the opportunity to incorporate a unique safety feature which requires that the clutch be depressed before the engine will start. Just as the engine has taken a step up so has the automatic transmission in the form of the Turbo Hydramatic 4-speed 4L65E HMD exclusive to HSV. It’s a heavy duty unit, like its predecessor, but features detailed internal modifications including a 10% higher stall torque converter and a smarter torque converter lock up clutch which further aids fuel efficiency. In response to customer feedback HSV has calibrated the auto for a quick, firm, precise shift feel. The remarkably broad torque output of the LS2 has rendered the ‘Power’ mode superfluous and it has subsequently been deleted. The greater torque loading from the exclusive new engine, via the clutch and transmissions, required an exclusive tail-shaft which has been increased in diameter from 54.1mm to 60mm and in wall thickness by 0.2mm. For the Maloo and long wheel base WL Grange, the task was even more involved with HSV engineers actually designing totally new tail-shafts for these models. Continuing further along the drivetrain, the new HSV unique differential sees manual and automatic models share the same ratio – a higher 3.46:1. For greater strength and durability the differential gear set, itself, has been subjected to a special shot peening process. The rear axle half shafts, which transmit drive from the differential to the wheel hubs, have been strengthened by incorporating two plunging joints instead of one. The upshot for automatic Z Series models is that the combination of immense torque from the LS2 engine, a 10% higher stall torque converter and a lower differential ratio has resulted in a simply sensational launch feel and acceleration times on a par with, if not better than, manual versions! All Z Series models also benefit from the latest generation, state-of-the-art Bosch ABS 8 system which includes Electronic Brake Force Distribution. Here, it has been specially calibrated to match each of HSV’s exclusive braking packages to ensure they continue the tradition of powerful, fade free retardation combined with excellent pedal feel. Mechanical Brake Assist is also fitted to all Z Series models to assist in maximising brake performance during emergency braking situations. The HSV Performance Braking package – standard on Maloo, ClubSport, Senator, GTO Coupé and Grange – has been up-rated with Corvette C6-type twin-piston front callipers. They are more rigid in construction and deliver a higher clamping force and increased brake pedal feel. In response to customer demand the race-bred HSV AP Racing Six-Piston Brake System – which sensationally debuted on GTS models – is now available as an option on Maloo R8 and ClubSport R8. With six-piston front and four-piston rear callipers acting on 362mm front and 343mm rear grooved discs, this is still one of the most powerful braking systems fitted to any production car in the world today.